Do you ever wish you could make the task of cleaning your home a little easier? If so, housekeeping hacks are the way to go. As you probably know, a “hack” is a little tip or trick that is often unexpected, and can help make your job at hand a little simpler. Take a look below at 7 housekeeping hacks that you can try, so the next time you need to do a quick clean you can get the job done faster and with less stress. 1. Use denture cleaner for a sparkling toilet. Hate scrubbing the toilet? You aren’t alone! Drop a few denture tablets into the bowl and let them sit for the time indicated on the package. Then just flush and enjoy a sparkling clean toilet. The tabs work hard to dissolve stains and whiten the bowl. 2. Use dryer sheets to repel dust. Everyone hates dusting, especially if they have allergies. Use dryer sheets as the cloth when you dust. They will not only remove the dust that is present but will help repel dust that wants to settle on hard surfaces in the future. They are especially helpful when used along base boards where dust tends to settle often. 3. Olive oil can make furniture shine. A few drops of olive oil on a soft cloth is the perfect way to make furniture shine. Use it on your hard surfaces such as dining room tables, side tables, and other accent furniture pieces. You can even use it on leather to help condition it and make it shine, or swab some on plant leaves to make them rich and dust free. 4. Use lemons to clean the drain. Cut up lemons into chunks and drop a few down the drain, then run the disposal for a few seconds. Lemon oil found in lemons not only cuts through grease and grime, but helps make the drain smell a whole lot better too. Never toss out old and used up toothbrushes. Instead save them, and make a paste of baking soda and water. Use the toothbrush and the paste to scrub grout and tiles that are in need of a good scrubbing. They do a great job when paired together. 6. Save those old socks. Old socks placed over your hands can make great dusting tools. Just swipe them over your surfaces for a great clean. When done, just toss them in the wash and use them again and again. They are sure to save you some cash. 7. Keep vinegar on hand. Vinegar makes a wonderful cleaner for when you are in a bind and don’t have any of your usual all-purpose cleaner on hand. It can be used to make glass shine, and can clean sinks, tiles, and floors as well. Don’t like the scent? Try adding a few drops of your favorite essential oil. Citrus oils will boost its cleaning power and make the mixture smell fantastic. The next time you need to clean in a hurry, give these housekeeping hacks a try. They are sure to make the job a little bit easier, and maybe even a little fun. Good luck! 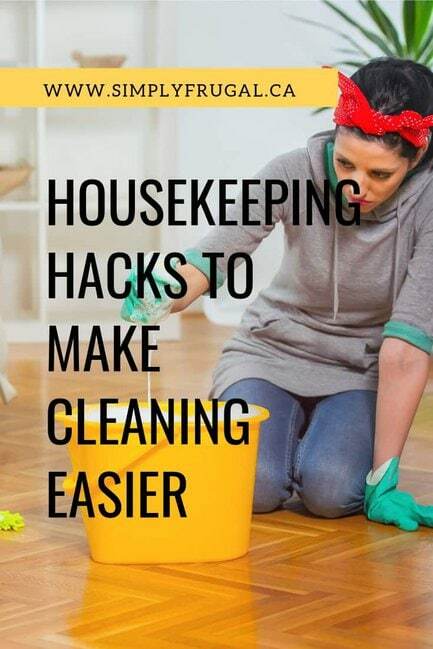 Do you have any tried and true housekeeping hacks that you can share in the comments?